Fire & Rescue NSW Inspector Gary Wright, left, North Coast Nationals MLC Ben Franklin, Parliamentary Secretary for Northern NSW Adam Marshall, Alstonville Fire Captain Jeff Snow and Fire & Rescue NSW Zone Commander Greg Lewis handing over the keys to the new $310,000 Class 2 pumper today. FIRE protection and emergency response services across the Northern Rivers has received a huge boost today with the arrival of a new $310,000 fire truck. 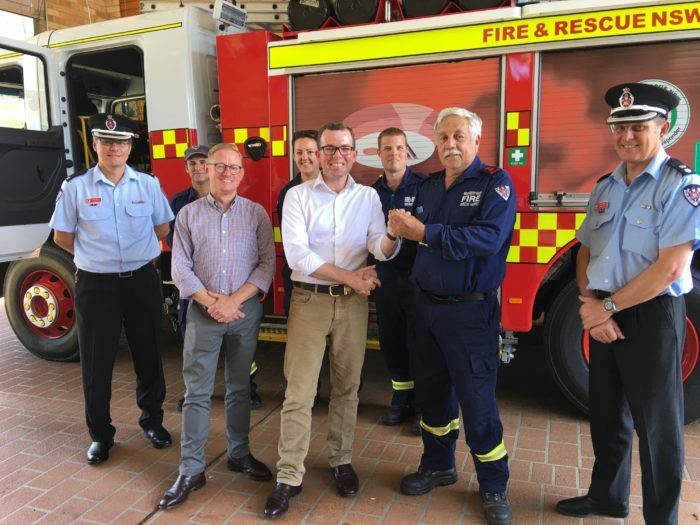 The Mercedes Benz appliance, referred to as a ‘Class 2’ pumper, was handed over to the Alstonville Fire Station by Parliamentary Secretary for Northern NSW Adam Marshall and North Coast Nationals MLC Ben Franklin. They were joined by Fire & Rescue NSW Zone Commander Greg Lewis, Alstonville Fire Captain Jeff Snow and local retained firefighters for the short ceremony. Mr Marshall said the Class 2 pumper had the latest equipment and technology which would increase the capacity of Fire & Rescue NSW firefighters to deal with fires, accidents, chemical spills and other emergencies. “The NSW Government is committed to providing firefighters with the best equipment and technology available and I’m delighted to do the honours today in commissioning this new pumper,” Mr Marshall said. Mr Franklin praised the Alstonville firefighters, led by Captain Snow and Deputy Captain Jason Simpson, who he said did a tremendous job responding to fires, rescue incidents and other emergencies as well as actively promoting fire safety in the community. “The Alstonville station is one of only nine Fire & Rescue NSW first responder units across the state, meaning they are often called upon to be first on the scene of major road accidents and perform paramedic duties until Ambulances arrive,” Mr Franklin said. “This is all on top of their regular fire and hazardous materials response capabilities, which sees them respond to around 150 call-outs each year. “These firefighters are at the coal face keeping our community safe every day and I’m really pleased the government is providing the very best equipment available to enable them to do their jobs effectively and safely.